Hi ladies! I had no idea what on earth to call this mani so "Spring fever" it is haha. The weather has FINALLY warmed up here in Sydney so I needed a mani to go with the warmer weather. I'm so sick of the cold! 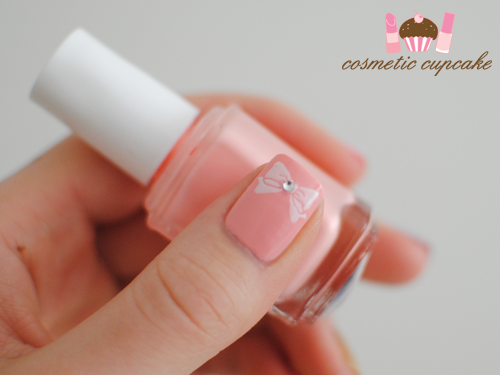 Pinky: I used 3 coats of Essie Van D' Go* as a base and added a bow nail sticker I bought in HK. Ring finger: I used 1 coat of OPI Glitzerland and added a few coats of Deborah Lippmann Boom Boom Pow. Unfortunately Boom Boom Pow isn't as opaque as I had hoped even after a few coats but it's still another gorgeous glitter from the awesome Deborah Lippmann!! Middle finger: I used 2 coats of Barry M Berry Ice cream. Index finger: I used 3 coats of China Glaze Empowerment as a base. I think Empowerment is one of my favourite pink polishes seriously! I then konaded full dot image from Konad plate m79 using Konad Special polish in white. Thumb: I used 3 coats of Essie Van D'Go* as a base. I then konaded bow design from Konad plate m59 using Konad Special polish in white and finished off by adding a silver rhinestone to the centre of the bow. I hope you've all had a lovely weekend. 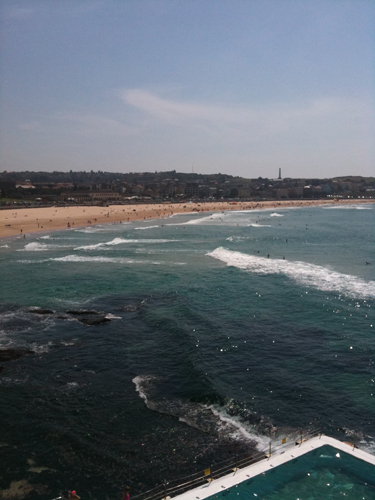 I'll leave you with a quick pic of beautiful Bondi Beach I took on Saturday - I had the pleasure of attending an event at Bondi Icebergs and this was the awesome view from the balcony! Thanks for looking as always! Don't forget to enter my Pink for October giveaway here! Very cute! I love your nails, they are perfect! Oh how I wish I could go to that beach! We are having rainy weather in the Pacific Northwest! I'm in love with this mani! love it :D it looks so cute !! Oh it looks so cute! I'm going to do a little bit of a spring manicure today... it won't be even an INCH an good as this but I'll give it a go!! OH and I now have a DOTTING TOOL hahahahaaha it's been a long time coming!! I love your manicure style - all these diverse colours, shapes and patterns and you make it work somehow! I wish I could do that! I am not so in love with pink but I love the bows!! !